The SMSC-TC isolating thermocouple conditioner offers wide ranging input and output capability. The SMSC-TC can be field configured by the user to accept input from thermocouple Types J, K, T, E, R, S, and B and to provide current or voltage output. The output is linearized to temperature according to the particular thermocouple type. The SMSC-TC is a three-port industrial isolator—the output is optically isolated from the input up to 1500 V, and both input and output are transformer isolated from the line power. Isolation allows the noise reduction benefits of grounded thermocouples to be realized without creating ground loop problems and it provides faster response. The SMSC-TC utilizes the latest in advanced analog/digital signal processing technology. In addition to its multiple microprocessors, it employs special ASIC circuitry for high accuracy and reliability. The SMSC-TC is equipped with cold-junction compensation (CJC) circuitry to provide icepoint reference. Upscale, downscale or disabled thermocouple burnout detection is switch selectable. 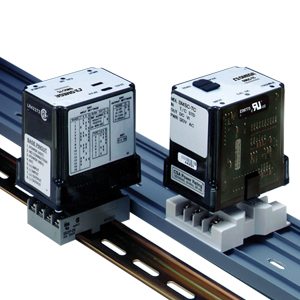 The SMSC-TC is useful in any application requiring an isolated DC output from a thermocouple input. Typical applications include energy management and data acquisition of process temperatures. The output of the SMSC-TC can drive a digital meter for direct display or interface with a computer for monitoring and control applications. Model SMSC-TC is equipped with top-mounted LEDs for INPUT (green), TROUBLE (yellow) and CAL OK (yellow). At start-up, both the INPUT and the CAL OK LEDs light up momentarily for 1 second. Afterwards, these LEDs flash alternately for 10 seconds while startup takes place. The input LED is a diagnostic tool. It remains continuously lit if the measured temperature is within the selected range of the thermocouple. However, if the measured temperature is outside the full range of the thermocouple (for example, for a Type J below minus 200°C or above 750°C), the LED will flash at a rate of 4 or 8 Hz for under/over range, respectively. If the thermocouple is within the full temperature range, but outside the selected sub-range (for example, if a Type J thermocouple is set for a range of 375 to 500°C and the temperature is either below 375°C or above 500°C) the LED will flash at 0.5 or 1 Hz respectively. The CAL OK LED is continuously on when the device is properly storing the factory calibration reference voltage. The TROUBLE LED is off during normal operation of the device. A major advantage of the SMSC-TC is its wide ranging capabilities and ease of configuration. The SMSC-TC enables 50% input zero and span adjustability within the selected sub-range. For example for Type E thermocouple range from -18 to 125°C, since the span can be contracted by 50%, this enables an input span as narrow as 50% of 143, or 72°C. This span can then be positioned anywhere within the temperature range and can have a zero step-up as large as 50% of the full scale range (e.g. span can start as high as 53°C).